Gluten Free & Allergy Friendly: Lunch Made Easy: Tacos for Her, Nachos for Me! 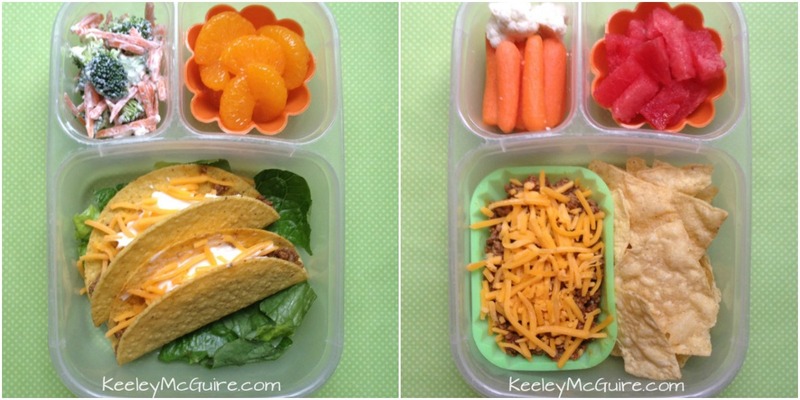 Lunch Made Easy: Tacos for Her, Nachos for Me! I love taco night because that means leftovers for the easylunchboxes the next day! There was *actually* enough left this time (I knowingly bought a little more ground beef than typical) for us both to have it in our lunches. Woo! 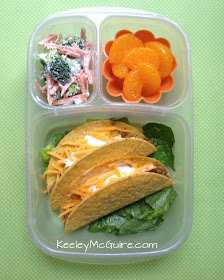 Little Miss has her EasyLunchBox complete with two corn shell tacos, broccoli salad mix, and mandarin oranges. Mama has her leftover taco meat and cheese in a small silicone dish so I can heat it up in the microwave to enjoy with my tortilla chips. I also have baby carrots, a few cauliflower bites, and watermelon dices. Looks delish! What is in your broccoli salad? Is that just carrots broccoli and ranch? I have a very particular eater and she will not stand for soggy taco shells!!! Are those mini taco shells? If not, I am amazed that you can fit two shells into the easy lunch boxes like that. There is no way I could fit two shells into ours like that. 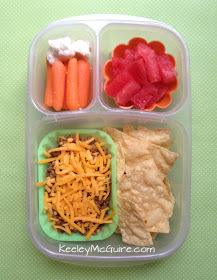 I love the little containers that hold the watermelon and taco meat. Where could i find them?